The presence of Salmonella enterica serovar Typhimurium becomes a concern in relation to the safety of drinking water and ice. We detected and enumerated the bacteria from ice and beverages collected from several areas in Jakarta. Most Probable Number (MPN) and multiplex PCR method were used. Three sets of primers were used rfbJ, fliC, and fljB. Two Multiplex PCR’s were performed, the first is to detect the presence of Salmonella and the second is to confirm the positive isolate of S. enterica serovar Typhimurium. A total of 50 beverages and 50 ices were collected MPN result ranged from < 3 to > 11,000 MPN/ml. The highest MPN value > 11,000 MPN/ml. The first Multiplex PCR result from beverages, 58% positively contained Salmonella spp. with amplification of fliB gene and no amplification of rfbJ and fliC genes. For ice samples, 2% positively contained Salmonella spp. with rfbJ gene amplification, 62% fliB gene and no amplification of fliC gene. The second Multiplex PCR results from beverages identified 21 positive isolates of S. enterica serovar Typhimurium. In which, 17 isolates contained fljB gene and 4 isolates contained both fljB and rfbJ genes. From ice, 17 isolates having both rfbJ and fljB genes. Salmonella is the causative agent of salmonellosis. Salmonella typhi and Salmonella paratyphi are pathogenic exclusively for humans, causing systemic infections and typhoid fever, whereas Salmonella enterica serovar Typhimurium cause gastroenteritis . The O factor of this bacteria determines the serogroup and the H factors define the serotype . The flagella antigens H1 (phase 1) and H2 (phase 2) are encoded by fliC and fljB genes, respectively. These two genes are present at two different locations on the Salmonella chromosome. However, one of them is expressed at one time due to phase variation . In Salmonella, the genes responsible for biosynthesis of the O antigens are normally grouped together on the chromosome in a gene cluster called rfb . Salmonella comprise two species, which are S. enterica and S. bongor . Salmonella infection is one of public health problems in developing countries, including Indonesia. Several publications reported high incidence of Salmonella infection in Indonesia . Several techniques for the detection of Salmonella have been developed such as serology test, selective culture medium, and enzyme linked immunosorbent assay . However, these methods have several limitations because of low sensitivity and specificity. The Polymerase Chain Reaction (PCR) is a rapid method for detection and identification of pathogens such as Salmonella. These molecular methods, such as multiplex PCR, are highly sensitive, very specific, fast and reproducible . The aim of this study is to quantify the number of Salmonella contamination from ice and beverage samples using Most Probable Number (MPN) and Multiplex PCR method. The positive isolates were assayed for antibiotic resistance. In this study, we monitored and enumerated the presence of Salmonella enterica serovar Typhimurium, with particular reference to pathogenic potential and profiles for epidemiological analysis and risk assessment. A total of 100 samples (50 ice and 50 beverages) were collected in Jakarta. The samples were collected from five different regions in Jakarta, designated as North, South, East, West, and Central Jakarta. In each case, 25 ml of sample was inoculated into 225 ml of Buffered Peptone Water (BPW) (Oxoid, Hampshire, England) . All inoculated BPW were incubated at 37 °C for 16–20 h.
Serial dilutions of 1:100 and 1:1000 Rappaport–Vassiliadis (RV) (MERCK, Darmstadt, Germany) were prepared in triplicate to pursue three-tube MPN-based enumeration . All inoculated RV tubes were incubated at 42 °C for 24 h.
As much as 1.5 ml of RV positive was centrifuged at 13,684×g for 3 min, then resuspended in 500 µl of sterile distilled water, boiled for 15 min, and used as cell lysates containing templates for PCR. PCR were done using primers rfbJ, fliC, and fliB . We used S. enterica serovar Typhimurium S43 positive to rfbJ and fljB genes as positive control for multiplex PCR. A volume of 25 µl containing 12.5 µl of GoTaq (Promega, Madison, WI), 1 µl of each of the three primer-pairs (EUROGENTEC AIT, Singapore), 2.5 µl of DNA template, and 4 µl of nuclease free water (Promega, Madison, WI). PCR was programmed as follows: an initial denaturation at 95 °C for 3 min, followed by 20 cycles, each consisting of 95 °C for 1 min, 65 °C for 1 min, 72 °C for 30 s, and a final extension at 72 °C for 1 min. To confirm the presence of Salmonella, positive RV broth culture were diluted from 100 to 10−4 in 0.85% NaCl then spread onto Xylose Lysine Desoxycholate agar (XLD) (OXOID, Hamsphire, England) and incubated at 37 °C for 24 h.
The suspected S. enterica Serovar Typhimurium colonies were inoculated into Brain Heart Infusion Broth (BHIB) (Oxoid, Hampshire, England) and incubated at 37 °C, overnight. Eight or more suspected colonies were selected. 1.5 ml portions of turbid BHIB were centrifuged at 9503×g for 3 min, resuspended in 500 µl of sterile distilled water and boiled for 15 min. The supernatants were used as a template for the second multiplex PCR. 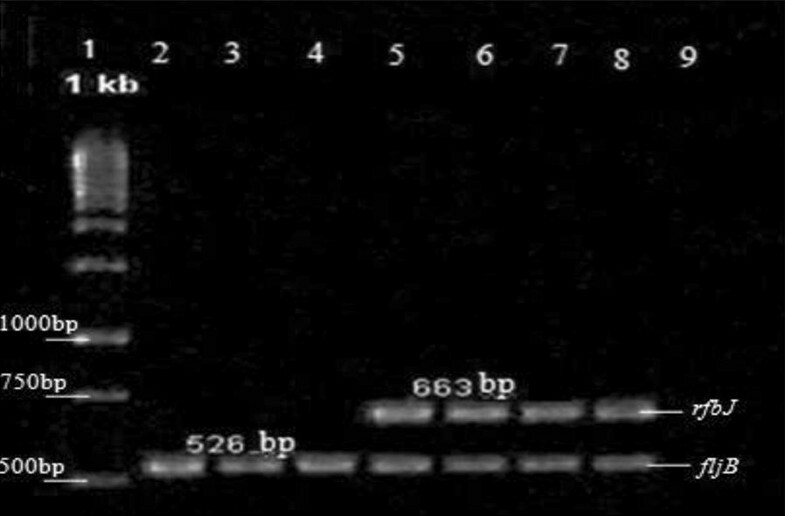 The reaction and conditions of second multiplex PCR were similar to the first PCR. The disc diffusion method (Kirby–Bauer) was used for antibiotic susceptibility test. The positive isolate of S. enterica serovar Typhimurium was cultured in BHIB medium and incubated at 37 °C for 18 h. The bacterial suspension was streaked in Mueller–Hinton agar (MH) (Benton-Dickinson, USA). A total of 9 antibiotics disc such as Streptomycin (10 µg), ampicillin (10 µg), trimetophrim (5 µg), ciprofloxacin (5 µg), erythromycin (15 µg), tetracycline (30 µg), kanamycin (30 µg), gentamicin (10 µg), and nalidixic acid (30 µg) (OXOID, Hampshire, England) were used. Zones of inhibition were measured and analyzed using CLSI standard . Ice samples from North Jakarta, East Jakarta, Central Jakarta, and South Jakarta showed the same number of Salmonella spp, which was 2400 MPN/ml. Ice samples from West Jakarta showed a different number of Salmonella spp., which was > 11,000 MPN/ml (I.WJ.9 isolate). Most of the ice samples showed MPN value of < 30 MPN/ml. Almost 34% of the samples (17 of 50) had MPN value of 230 MPN/ml. The highest MPN value > 11,000 MPN/ml was found in sample from East Jakarta (B.EJ.4). The lowest MPN value 3 MPN/ml was found in sample from Central Jakarta (B.CJ.1). The highest values from ice and beverage samples were the same (> 11,000 MPN/ml), but they were from different locations. Beverage sample was obtained from East Jakarta (B.EJ.4), while ice sample was obtained from West Jakarta (I.WJ.9). Multiplex PCR results presented in Table 1 showed that from 50 beverage samples, there are 29 positive samples (58%), having positive result for fljB gene in all samples. The number of positive sample for each area is as follows: Central Jakarta 3 of 8 (37.50%), East Jakarta 9 of 9 (100%), West Jakarta 5 of 9 (55.55%), South Jakarta 7 of 16 (43.75%), and North Jakarta 5 of 8 (62.50%). The rfbJ and fliC genes were not found in all beverage samples (Table 1). Thirty-one ice samples positively contained Salmonella spp. (62%) were found from the total of 50 ice samples. The number of positive sample for each area is as follows: Central Jakarta 7 of 11 (63.63%), East Jakarta 7 of 7 (100%), West Jakarta 3 of 6 (50%), South Jakarta 8 of 15 (53.33%), and North Jakarta 6 of 11 (54.55%). Most of them showed positive for fljB gene. One sample from East Jakarta (I.EJ.2) was found to carry two amplicons from fljB and rfbJ genes. The fliC gene was not found in all ice samples (Table 1). From the 424 of suspected colonies, we found 21 positive isolates indicated as S. enterica serovar Typhimurium. Seventeen isolates (80.95%) had fljB gene and 4 isolates (19.05%) had both fljB and rfbJ genes. The fliC gene was not found. All of the positive isolates were found in samples collected from North, South, and East Jakarta. A total of 568 suspected colonies of S. enterica serovar Typhimurium were obtained from 31 ice positive samples. We found 17 positive isolates indicated as S. enterica serovar Typhimurium. One isolate (2.5%) was obtained from I.EJ.3 sample and 16 positive isolates (66.67%) were obtained from I.EJ.2 sample. They had rfbJ and fljB genes. All of these isolates were obtained from ice samples of East Jakarta (Table 2). The multiplex PCR products are shown in Fig. 1. The antibiotic resistant patterns of 21 isolates from beverage and 17 isolates showed that for beverages 66.67% resistance for streptomycin (10 µg), 66.67% for ampicillin (10 µg), 9.57% for trimethoprim (5 µg), 28.57% for ciprofloxacin (5 µg), 66.67% for erythromycin (15 µg), 52.38% for tetracyclin (30 µg), 28.57% for kanamycin (30 µg), 71.42% for gentamicin (10 µg), and 28.57% for nalidix acid (30 µg). The percentages of resistance in ice isolates are 82.35%; 23.53%; 0%; 17.65%; 82.35%; 23.53%; 23.53%; 76.47%, and 17.65% respectively. The highest percentage of resistance was shown by streptomycin (10 µg) and erythromycin (15 µg). The MPN value indicates the risk of transmitting diseases to humans through beverages and ices. Several publications have reported specific detection of S. enterica serovar Typhimurium by multiplex PCR using rfbJ, fliC, and fljB genes . The flagella antigens H1 (phase-1) and H2 (phase-2) are encoded by fliC and fljB genes, respectively . From the first multiplex PCR, 29 samples positive from beverages, and 31 samples positive from ice. Both samples was found to be positive fljB gene, except ice sample from East Jakarta (I.EJ.2) which gave positive amplification for both fljB and rfbJ genes. There were no positive amplification of fliC gene from both ice and beverage samples. From the second multiplex PCR, we found 17 positive isolates of S. enterica Serovar Typhimurium from ice sample obtained from East Jakarta. One isolate (2.5%) was obtained from I.EJ.3 sample and 16 isolates (66.67%) were obtained from I.EJ.2 sample. These isolates gave positive amplification of both rfbJ and fljB genes. Therefore, the contamination might occur from the same source of contamination, such as source of water. The environment near the location in which the samples were collected were unhygienic that might contribute to the S. enterica serovar Typhimurium contamination. The second multiplex PCR result from beverages showed 21 positive isolates shows of S. enterica serovar Typhimurium, the samples were obtained from North, South, and East Jakarta. S. enterica serovar Typhimurium contamination was more distributed in beverage samples than in the ice samples. We found more S. enterica serovar Typhimurium isolated from beverages than ice. It indicates that the beverage samples were more contaminated by S. enterica serovar Typhimurium than ice sample, because the source of contamination can come from raw water usage for beverages or due to unhygienic storage. In this study, we obtained rfbJ and fljB genes from S. enterica serovar Typhimurium isolates (lack of fliC amplicon). Lim et al. reported that three sets of primer targeted rfbJ, fljB, and fliC genes caused specific identification of O4, H:1,2 and H:i antigenic properties, respectively. Only S. enterica serovar Typhimurium had the antigenic structure combination of O4, H:1,2, and H:i out of about 2000 serovars. Besides that, other studies reported that PCR produced 663, 526, 284, and 183 bp amplicons from rfbJ, fljB, invA, and fliC, respectively, in all 9 serovars . Shanmugasundaram et al. reported that isolates which showed positive for rfbJ gene were confirmed as S. enterica serovar Typhimurium. It could identified two of seven biochemically suspected Salmonella isolates that were later confirmed as S. enterica serovar Typhimurium. The fliC amplification showed a large number of serovars of S. Enterica group, including S. enterica serovar Typhimurium. The fljB gene was detected in all strains of S. enterica with the exception of S. enterica serovar Typhi. In this study, we obtained Salmonella enterica serovar Typhimurium that lack of phase-1 antigen (fliC gene). Monophasic variants were different from monophasic serovars because monophasic serovars did not have the second phase flagellar antigen . We conclude that Salmonella enterica serovar Typhimurium isolates that we obtained in this study were monophasic variant. Antibiotic-resistant Salmonella isolates are important for public health. All of the S. enterica serovar Typhimurium isolates we identified were resistant to at least 2 antibiotics. The widespread use of antibiotics as a treatment for diseases and to promote growth in the livestock and poultry industries has resulted in the emergence of resistant strains . Salmonella enterica serovar Typhimurium phage type DT104 strains, which contains an antibiotic gene cluster resistance to ampicillin, chloramphenicol/florfenicol, streptomycin/spectinomycin, sulphonamides, and tetracycline [16, 17]. S. enterica serovar Typhimurium resistant to gentamicin and kanamycin . This study has showed various results of antibiotic resistance in S. enterica serovar Typhimurium isolates from ice and beverage samples. We found high incidence of Salmonella spp. which was resistant to multiple antibiotics. The improper use of antibiotics to treat pathogenic bacteria associated with diarrheal disease in Indonesia might increase antibiotic resistance. Multiplex PCR might detect other Salmonella which also have similar virulence genes. The original version of this article was revised: the name of one of the authors had been presented incorrectly. It should be Audora Sabatini Theresia, not Audora Sabatini. A correction to this article is available online at https://doi.org/10.1186/s13104-019-4131-5. DW made substantial contributions to conception, design, and interpretation of data; EW and AT contribution acquisition of data and analysis. All authors read and approved the final manuscript. This research was supported by a Grant from the International Foundation for Science (IFS), project no. E/4626-2F. Karlavägen 108, 5th floor, S-115 26 Stockholm, Sweden. The funding body give advice in the study design. [USDA/FSIS] United States Department of Agriculture/Food Safety and Inspection Service. Most probable number procedure and tables. In: Microbiology Laboratory Guidebook. Appendix 2.03. Washington, D.C. 2008. http://www.fsis.usda.gov/PDF/MLG_Appendix_2_03.pdf. Accessed 28 June 2010.